Astronomers working with the Spitzer Space Telescope announced a tremendous new advance today, when they used the great observatory to successfully analyze the atmosphere of two distant planets. This is an enormously important discovery, and we’ll deal with the implications of this in a second. First, though, let’s talk about what they turned up. The planets are known as HD 209458b and HD 189733b. These are your typical hot Jupiters, orbiting their parent stars at extremely close distances. Astronomers originally estimated that these planets should have large quantities of water in their atmospheres. Surprisingly, though, the Spitzer data showed that they’re drier and cloudier than expected. The discoverers think the water is there, it’s just hidden beneath the clouds. It’s also possible that the planets have large quantities of silicate dust, which obscures the view to water. Now, let’s talk about the impact of this. Think for a second. 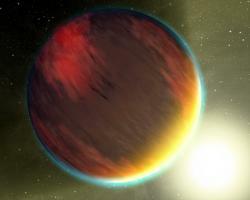 Astronomers have used a space telescope to study the atmosphere of a planet orbiting another star. Obviously, a hot jupiter, with temperatures in the thousands of degrees isn’t a good place to look for life. But think of it as a dress rehearsal; an opportunity to fine tune techniques and instruments. This technique will come in handy in the coming years when more powerful telescopes are launched, capable of finding rocky planets orbiting other stars. Once one of those telescopes turns up large quantities of oxygen in the atmosphere of another star, you’ve got a good candidate for life. I can hardly wait.